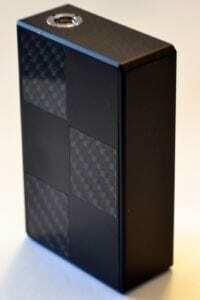 Up today is the SMY Touch Box 100 watt from Cigabuy. At the time of this writing it is currently selling for $53.62, and you can get it here. Buy for $53.62 – Same version reviewed, Ships from China. Buy for $75.99 (Coupon: 5%downforyou) – Ships from the USA. SMY packaging is nice, with a protective foam cradle for the mod, and a solid cardboard “gift box” design. Inside the box is the mod, an instruction sheet, USB cable, quality control certification card, and microfiber screen cleaning cloth. Upon removing the mod from the package I was struck immediately by a loud rattling sound from the inside of the mod. The second thing that caught me be surprise is how light weight it actually is. Given that it includes 2600 mah worth of Lithium Polymer batteries already installed in it, at roughly 6 oz it is exceptionally light. Once powered on, the screen looked just as good as expected. I was a little surprised, and I might add disappointed, that SMY did not keep their previous beautiful speedometer style screen design and simply add touch capability to it, instead they completely revamped it. The “home” screen looks very pretty and modern, almost like you would expect from a cell phone or tablet. None of the other screens, however, look as nice or modern, they are simply functional and made to get the job done, not look good. While functional, these menu screens just don’t mirror the beauty of the main screen and as a result looks more like an afterthought. The Touch Box itself is definitely a “box” mod. Thankfully SMY chose to bevel all the main edges and most of the corners of the mod so that they don’t cut into your hand, although I would have preferred it if they had rounded all the edges and corners instead of beveling them, I think it would have looked and felt a little better. There is a single stainless steel “fire” button on the right face of the mod, a large 2.4 inch display/touchscreen, a stainless steel, spring loaded, 510 connector on the top above the fire button, and the USB charging port and venting holes on the bottom of the mod. The instruction sheet is horrible. It is poorly translated into English, but mostly usable. I say mostly as the instructions for the DIY mode are awful and I could not even figure out from the instructions what DIY mode is actually supposed to do. SMY really needs to work on finding someone to translate this information better for future mod releases, especially if they try and implement an unknown feature like DIY mode. If something comes with instructions, anyone should be able to pick them up, read them and use every feature. Here is the specifications listing, from SMY’s website, it looks pretty impressive on paper. You will see in the list above that this mod is powered by a 2 cell 2600 mah LiPo battery which is two 1300 mah individual cells. Don’t be fooled, the run time from these batteries doesn’t sound great, but it outlasts my 2500 mah Samsung 25Rs by about 2+ hours. There are two issues with the batteries, the first is that when they die, they die fast. I have noticed that the mod will go from about half a charge (by the display indicator) to ZERO charge in a matter of hits. The second issue with the batteries is that they are not user serviceable (sealed construction, no way into the mod), meaning that when they die, the mod becomes worthless and you have to buy a new mod, or pay to have SMY install new batteries. The mod looks nice from the display side, but the back just looks like a tacky fake carbon fiber checkerboard, with some visible glue along the top seam of the one I received. There is something broken inside of mine, and it rattles when I shake it. I did contact SMY technical support about the rattle, and they offered to fix the mod for free under warranty, but my last experience with SMY took 2 months to get my mod back, and this review couldn’t wait that long. I will get it fixed later once the review is complete. There are no screws to be found, I suspect the entire thing is held together with glue. All of the edges and only six of the corners are beveled, the two that are not beveled are at the top nearest the side with the fire button (front?) of the mod, the two corners on the face above the fire button, nearest to my thumb are un-beveled and pretty uncomfortable if you brush against them with your thumb or fingers. The fire button looks and feels like it’s made of stainless steel and provides good feedback when pressed. The downside is that it is very loud and clicky, and also rattles a little bit. It was impossible to determine how loud the button rattle actually is due to the broken piece rattling around loudly inside the mod, but it was loud enough to be audible. The 510 connector also appears to be stainless steel with a spring loaded center pin that worked with every tank I put on it. There are 4 grooves in the 510 to allow airflow for old school bottom airflow tanks. The connector also sits slightly above the top of the mod, so tanks will NOT sit flush with the top of the mod, there is a small gap and no way to adjust it out. This ultimately reduces the stability of the tank mounted on the mod by allowing it to flex side to side ever so slightly. The SMY Touch Box uses gestures to control everything except actually firing the mod. There are four distinct gestures two L shaped gestures and two horizontal gestures. The screen is overly sensitive, adjusting it is difficult at best, personally I would call it a mess. It is so sensitive that it will self adjust simply from holding and using it, but worse, it will do it on it’s own in your pocket. Thankfully there is a screen lock, but you have to manually enable it. Even this protection is poorly implemented, once the screen lock is enabled it doesn’t actually turn itself on until after the mod has gone to sleep once, it isn’t immediate, even then it’s possible for the TouchBox to awaken and adjust itself inside my pocket, on it’s own. A left swipe adjusts the current wattage or temperature downwards. A Right swipe adjusts the current wattage or temperature upwards. A reverse or backwards “L” shaped swipe is a quick shortcut to shut the mod down, and an “L” shaped swipe will take you to the menu mode, where you will see the following six boxes: Work Mode, Puff Info, Settings, Help, Off, and Back. SS-TC – Stainless Steel Temperature Control in Celsius. SS-TF – Stainless Steel Temperature Control in Fahrenheit. NI200-TC – Nickel Temperature Control in Celsius. NI200-TF – Nickel Temperature Control in Fahrenheit. TI-TC – Titanium Temperature Control in Celsius. TI-TF – Titanium Temperature Control in Fahrenheit. DIY1-5 – Do It Yourself settings, there are 5 different options you can use here if they have been defined and enabled manually. Selecting this will show you the current amount of the puffs you have taken and the total time of usage in Hours, Minutes, and Seconds. There is also an option here to Reset all the puff info. 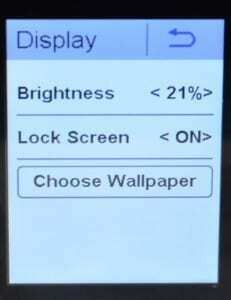 Display; is where you set the brightness of the display, enable the “Lock Screen”, and choose the wallpaper you want on the main screen. Time and Date; is where you set the date, max vaping time (default 20 seconds), LCD shutoff time (default 45 seconds), Auto Shutdown (default never). System Update; is where you will go when you want to update the firmware of the Touch Box. DIY Mode; is where you go to adjust the settings for each of the 5 DIY modes, including the “State” (ON or OFF). There is also a “Diagram Editor” that will allow you to tune the power curve of your vape. Page 1: This shows you the relevant information of your mod, including the firmware version. Page 2: Basic instruction on the gestures. Page 3: Resistance range for coils; Input and output voltages. Pages 4-7: Temperature control ranges and Error message information. As expected, this gives you the option of turning the mod off. This simply takes you back to the home screen. From what I can tell, the DIY mode is intended to ramp the power to your personal specifications so that you can customize and tailor the vape to your hearts desire. There is a “charting” tool for mapping each of the DIY profiles. It is incredibly sensitive and difficult to adjust. I have big fingers and as a result it isn’t easy for me be very precise in the tiny window with many sliders. In the settings menu it allows you to enable and disable profiles for DIY modes individually. 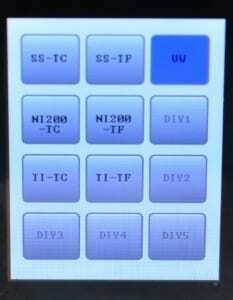 There are only temperature control settings for NI, TI, and SS. There is no ability to set a custom TCR for different coil types, so if you are using something other than 316 stainless steel (like 304, 317, 430, etc. ), you will not be able to tweak the TCR for the wire, which will definitely change the way it performs. Temperature control is very simplistic. Once you have set your desired mode in the settings menu, the only control you have over it is the ability to adjust the desired temperature up and down. There is no ability to set the maximum wattage, the mod decides what that should be based on the temperature settings. *NOTE* This section “may” be due to the fact that I am reviewing a defective mod, but I can’t say that for certain. The mod is supposed to be user upgrade-able, and there is an update available for download on the SMY website here. I was unsuccessful with actually getting the upgrade to apply. No matter what I tried, the mod was never recognized by the software and would not connect for the upgrade. I tried from 3 separate computers, with the exact same results. According to the video instructions, not only can you update the mod, you can also upload custom wallpapers for the home screen and boot logos. I couldn’t test any of this since I couldn’t update the mod. The SMY Touch Box seems to perform as expected in Power mode and Temperature Control mode. Like temperature control mode, it is very simple to use in Power mode because the only thing you can adjust is the desired wattage output. Despite the simplicity of this design, it does seem to work well and appears to be pretty consistent and accurate. DIY mode on the other hand is a hot mess. I have yet to be able to get it working properly, despite adjusting it repeatedly to try and dial in the settings I wanted. There is a diagram editor where they make it “easy” to swipe your finger in the curve you want and the mod will auto adjust the power to match the curve as you fire it. 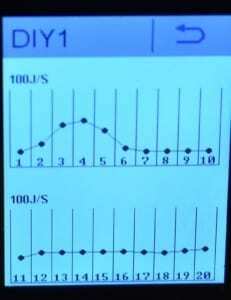 The problem is that my fingers are very large, and I could not get the resolution necessary to set an accurate curve. If I had teeny tiny fingers, it might have worked better. It is also possible to adjust the points individually, but again, my big fingers would not allow me to consistently and accurately adjust a single point. It appears that the DIY settings do not apply to temperature control, only power. The videos online appear to allow adjusting these settings in the update program on your computer, although I couldn’t test this since I could never successfully connect to my computer with this mod. I contacted customer support regarding the rattling of something inside the case of the mod, hoping they would be able to do something to assist before I conducted my review. After finally reaching someone on Skype, they requested a short video of the rattling sound. After I made the video (it’s really bad but gets the point across) and sent it to them, SMY told me I could send the mod to their US repair center. This is the same repair center that had my 60 watt TC Mini for over 2 months for a repair, so I declined in an effort to actually get the review completed. They did tell me that “the soldering point element has been falled out” and I would need a new board installed to fix it but I could still use it for the review. I did notify them that I would send it in after I got this review done, so if there are any changes after the repair, I will update this review. To be honest, I was surprised by their lack of concern that I would be doing the review with a known defective product. This troubles me enough to wonder if they stand behind their products or just pay lip service to the customer. At the end of the review is the 3 second video I sent to SMY, it is a really crappy video, but the audio is what is important and it gets the point across. The SMY Touch Box works well enough and is consistent, but is it really worth the cost? I do like some things about the mod, it comes in at a reasonable price point, the home screen looks awesome, the edges are beveled, the fire button provides feedback (even if it’s noisy), battery life is really good, and performance is consistent across all the traditional vaping modes. These are the big things I don’t like, BROKEN upon arrival, confusing DIY mode, lack of manual TCR, button rattle, tanks don’t sit flush, apparent lack of concern with known problems and issues, and an overall “cheap” feel. 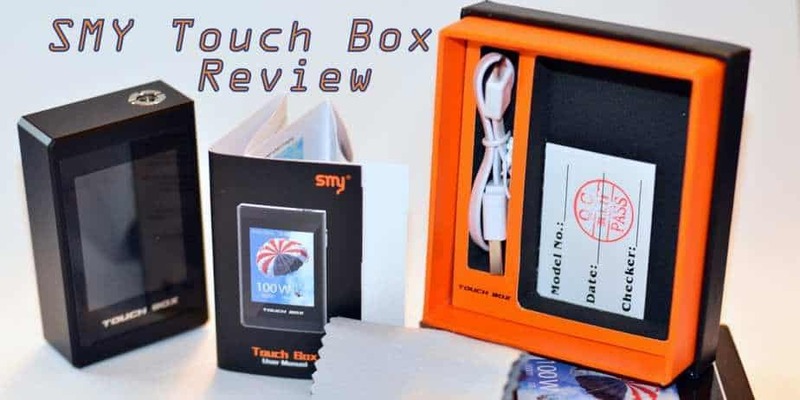 The bottom line is that the SMY Touch Box is a low quality, budget mod but it is one of the first with a touchscreen for the controls and display. It is a great idea, but poor implementation. Out of the box it was broken and SMY even admitted that this was a known problem with some of these mods. This mod has a “coolness” factor that many other mods don’t. The specs promise the world but the quality falls a bit short. If you can’t live without the coolness factor, then this mod may be for you, just remember that you get what you pay for. 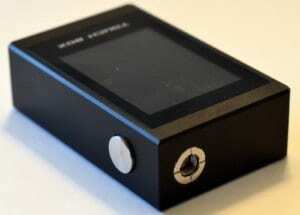 I recommend waiting to see what other touchscreen mods have to offer before buying into this SMY Touch Box. Thanks for the review. Looks impressive but the shiny part is way too for a device at this price. I would rather check out some cheap devices with good durability next time.